A new approach to language assessment and referrals is about to come to town. The Centralized Language Assessment and Referral System (CLARS) is the result of federal and provincial cooperation in the establishment of common assessment of language competency and a common referral of clients. Ottawa is one of four pilot sites to test the smooth running of this new approach. Ottawa was chosen as it will experience the implementation of CLARS in a unique way because the city attracts a large Francophone population and because of the presence of the largest French school boards in Ontario. CLARS is the result of a vocalized need by the language training community for creating unified and consistent language testing and referral system, bringing the provincial and federal funded programs together for the first time in this capacity. 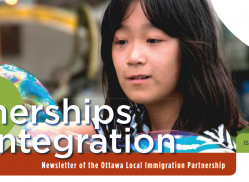 As was revealed by the Ottawa Immigration Strategy, “language training for newcomers in Ontario is funded by both the federal and provincial governments. However, lack of coordination programs leads to inconsistencies in language training, including differing standards, eligibility requirements, and factors affecting accessibility such as childcare and flexibility of hours.” The new CLARS will help solve some of these challenges. CLARS provides the ability to refer newcomers to the language training that best meets their needs, regardless of whether the course is funded by the federal or provincial government. For example, clients will now be made aware of service access locations so that they may choose the classes that are closest to their homes or workplace. In addition, with clear benchmarking of the level of language competency of individual immigrants, the program will be especially useful for newcomers looking for employment. And, with some further efforts, the new program may also enable Ottawa to assist employers to develop a greater understanding about language benchmarks. Another important shift in the new approach is that, thanks to the cooperation of federal and provincial governments, the CLARS model will serve all newcomers regardless of immigration status and ensure they have access to a high quality and professional language assessment in English and/or French, conducted by a certified CCLB language assessor. The one-stop approach will also allow both governments and the community at large to gain a better sense of the demographic, gender, age and other defining descriptors of learners accessing language training in Ontario. The next steps for CLARS are to convene the major players, especially the four school boards in Ottawa, to ensure implementation is carried out smoothly. CLARS should be implemented and working by September 2013, and be fully operational and evaluated by September 2014. More information, contact Tanya Mendes-Gagnon, senior director of Newcomer Services, YMCA-YWCA of the National Capital Region, tanya.mendes@nationalcapitalregionymca-ywca.ca, 613-238-5462 ext. 20.